Our chapter about „Cooperative Face-to-Face Learning with Connected Mobile Devices: The Future of Classroom Learning?“ got published as chapter of the book Mobile, Ubiquitous, and Pervasive Learning. Communication and collaboration among peers influence learning outcomes in a positive way. Therefore our research work focuses on enhancing face-to-face group learning with the usage of mobile devices by developing a learning game for iPhone/iPad devices called MatheBingo. 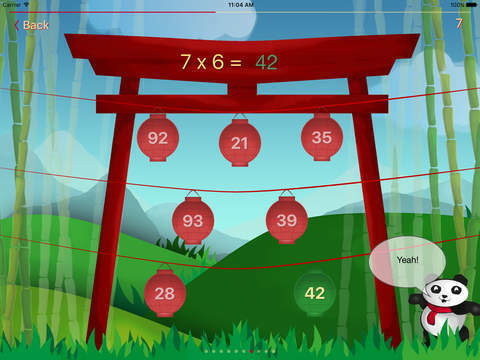 The app allows up to four learners to connect to each other through their mobile devices and learn together in a face-to-face setting. An initial evaluation in this field of research indicates the usefulness of such activities and how they uniquely motivate children to learn. It can be summarized that the connection of mobile devices is an important step towards the future of face-to-face classroom learning. Our publication at this year ED-Media 2015 conference „Collaborative Learning Through Drawing on iPads“ is now online available. Teamwork and collaboration skills are very important for improving learning efficiency and experience. 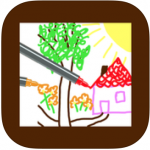 Therefore an innovative iPad app, called Teamsketch, was developed to provide a collaborative sketch environment for devices with which pupils can simultaneously draw one sketch together. Up to four pupils can take part in a session and train collaboration just by drawing a sketch. First of all different features and issues of state-of-the- art applications were evaluated. Afterwards a prototype from scratch using Apple’s new programming language Swift has been implemented. Additionally, a web service, a web interface and also a web site were programmed in order to provide an evaluation tool for teachers. 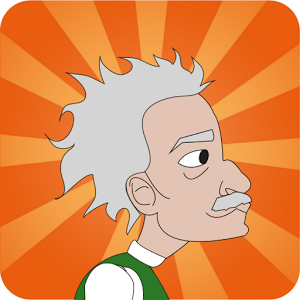 Furthermore, pupils can upload and download their drawn sketches and profile pictures. A first field test was carried out at the primary school Graz-Hirten. This test showed the potential of the app for training and evaluating team and collaboration skills. Reference: Spitzer, M. & Ebner, M. (2015). Collaborative Learning Through Drawing on iPads. In Proceedings of World Conference on Educational Multimedia, Hypermedia and Telecommunications 2015. pp. 633-642 Chesapeake, VA: AACE. In the last issue of 2014 of the journal „Profesorado. 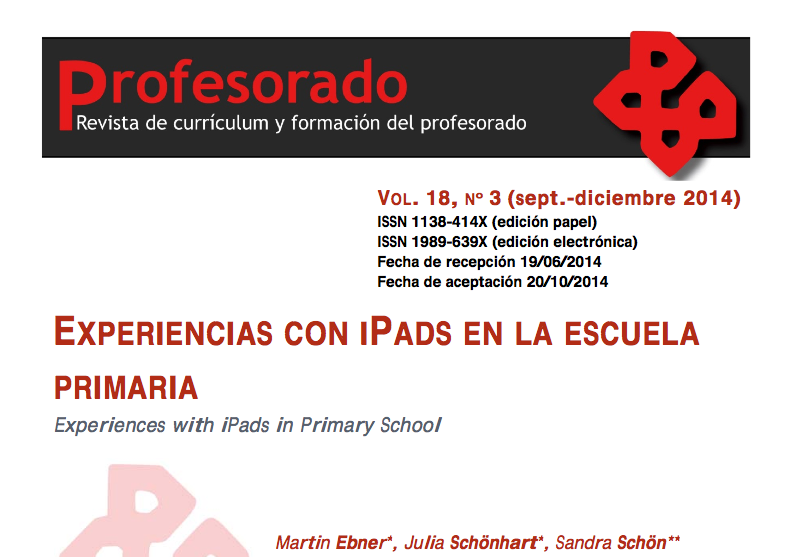 Revista de Curriculum y Formación del Profesorado“ our contribution about „Experiences with iPads in primary schools / Experiencias con ipads en la escuela primaria“ got published. The article is now available in two languages (englisch/spanish). Tablet computers gain enormous attention nowadays and become more and more part of our daily life. Due to this it is not astonishing that even the educational sector is thinking about the use of such wearable devices in the classroom. Our research study aims to give insights about real life experiences with iPads in Austrian primary schools. 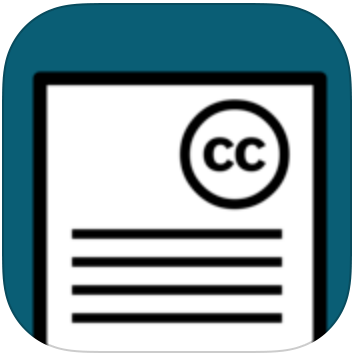 Therefore we describe the development of appropriate learning apps and their use in classrooms. Finally each technology-enhanced lesson is observed as well as evaluated afterwards with the help of the cut-off technique. The research work carries out different circumstances the use of tablet computers has a positive influence on teaching and learning and gives practical hints how they should be used in classrooms. Los ordenadores-tablet están acaparando toda la atención en estos momentos y forman parte de nuestra vida cotidiana. Por ello, no es de extrañar que en el ámbito educativo se hayan arbitrado fórmulas para incorporarlos en las aulas. La presente investigación pretende mostrar las estrategias llevadas a cabo en determinadas experiencias con iPads en escuelas primarias austriacas. Por un lado, se describe el desarrollo de las aplicaciones (apps) educativas apropiadas para su empleo en aulas. Y por otro, cada lección apoyada en las tecnologías es analizada y evaluada desde una perspectiva técnica. Las aportaciones más representativas de la investigación evidencian las diversas fórmulas de utilización de este tipo de ordenadores para promover una influencia positiva en la enseñanza, también se apuntan recomendaciones prácticas sobre cómo deberían ser usados en aulas.